Good. [ No Hassle 30 Day Returns ] [ Edition: first ] Publisher: Penguin (Non-Classics) Pub Date: 12/31/2002 Binding: Paperback Pages: 267. Good. The cover has minimal wear. Cover and/or pages are damaged. Fair. [ No Hassle 30 Day Returns ] [ Edition: first ] Publisher: Penguin (Non-Classics) Pub Date: 12/31/2002 Binding: Paperback Pages: 267. Very Good. 0142000280 Ships promptly from Texas. Great book for people who tend to start something and never finish........Get your life back in order. This is a very good book for figuring out how an individual can set up a PRACTICAL system for getting things done. I highly recommend it. I heard the author on Freethought Radio, and he sounded like he knew what he was talking about, so I got one of his books, and it was well worth it. Excellent transaction! The book arrived quickly and very well packaged and, as described, was in Like New shape. I was searching for something to help me be a more efficient homemaker. I was an efficient secretary but tend to be a mess as a homemaker. Mr. Allen's book was no help to me. Read this book if you are a procrastinator like me. 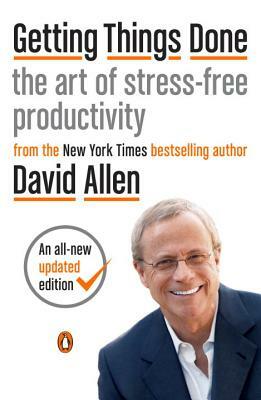 Immediately useful information and tips on exactly how to be more productive everyday. Use the tools inside to lower your stress levels and increase your production.